I will admit it: News.com.au is my guilty pleasure website. It isn’t my go to source for news, despite its relevant moniker; rather it serves as a bit of a relaxing look at whatever craziness is going on in the world, or more generally on the internet. 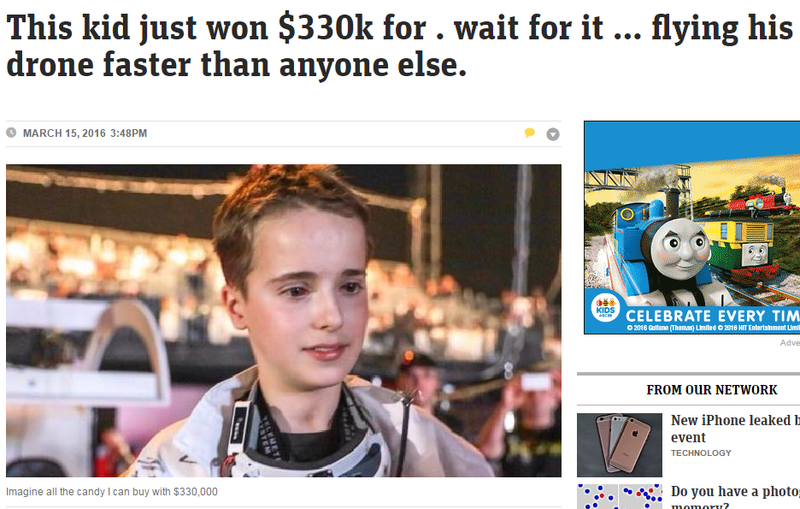 Now I know this is click bait, and they just want me to open the article so they get their dollars, but having read earlier in the day what the story was about, I was interested to see why they had chosen their clearly mocking tone.For those wondering, the boy had won a drone racing championship. Look at the derision in the title; look at how they are belittling this guy’s efforts, and for what? The kid did a good job at flying a drone, but they mock it as if that is no achievement at all. Yet scroll down the page a little and what do you find? An article about a racecar driver being mistreated. Why don’t they malign the fact that this man is famous for driving his car faster than anyone else? Go further down and there is a whole section about people who can do mundane tasks better than other people, whether it be running, riding an animal, kicking a ball, or even jumping in the air. And just because you don’t find it impressive, doesn’t mean that it can’t be a competitive, skillful and legitimate pastime. Granted there are more dangers inherent in some sports than others. There is no doubt that being a racecar driver exposes you to more risk than remotely piloting a quadcopter, but I hardly think this risk is what would denote a sport as being worthy of the name. Look at darts, or snooker, or any other sport that requires massive skill at limited personal risk.Really, the author just appears jealous of the fact that this kid has won a large sum of money for something they think isn’t worth it. Really, the author just appears jealous of the fact that this kid has won a large sum of money for something they think isn’t worth it. Well guess what man; that’s sport. I don’t see why people being able to hit a ball over a net repeatedly should be multimillionaires. But they are, and it’s because people want to watch it happen. I don’t care for it personally, much like I shall never pay money to watch a drone race; but so long as it doesn’t negatively impact on my life too much, I am willing to let it be. In fact the only time when the capricious nature of athlete-celebrity status really has any impact on my life is when the media hold them up to be role models, and then feign shock at anyone who misses the mark. So at the end of the day, if we are willing to accept running races, ball games, motorsports, etcetera as legitimate ways for people to not only spend their spare time but also earn a living, then it seems hypocritical to attack others for pursuing their own interests and making money from it. Let the kid have his day.